New complete rebuild kit for Honda CR 125 R, Each kit contains everything you need to complete your rebuild the right way, the first time- crankshaft and connecting rod (fully assembled), Namura piston, crankshaft bearings, and complete gasket & seal kit made to meet or exceed OEM. NX-10000K NAMURA TO P END KIT Please specify what year bike you are working on 56mm Piston is not av ailable with th is kit. Factory assembled and trued to within. 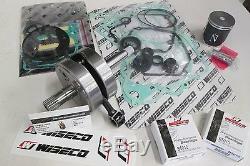 The item "HONDA CR 125R ENGINE REBUILD KIT CRANKSHAFT, PISTON, GASKETS 1992-1999" is in sale since Thursday, November 21, 2013.